Improved guidance for health professionals is a key feature of the updated driver medical standards contained in the latest edition of Assessing Fitness to Drive, which will come into effect from 1 October 2016. The new edition is the outcome of a review conducted by the National Transport Commission (NTC) during 2014 and 2015 and will replace the current 2012 edition. The NTC has worked closely with health professionals, driver licensing authorities and consumer health groups in conducting the review, which has resulted in some changes to the licensing criteria to account for developments in medical understanding and practice. A range of additional changes serve to improve clarity around the key considerations for assessing fitness to drive and support consistency of assessment and decision making. The new edition comes into effect on 1 October 2016, from which date all assessments conducted for the purpose of driver licensing should be undertaken according to the updated edition. There are a small number of significant changes that will affect drivers. These are summarised in the report Reviewing Assessing Fitness to Drive: Summary. The changes are summarised in the table below. The aneurysm diameter at which a conditional licence may be considered has been amended based on risk stratification for different aneurysm types and current management guidelines. For commercial vehicle drivers, clarity is provided that licensing is not permitted for ICDs inserted for primary prevention. New criteria have been developed to cover VADs. A conditional licence may be considered for a private driver requiring a LVAD subject to meeting several criteria. They may not drive if they require a combined LVAD/RVAD or an artificial heart. A VAD of any type is not acceptable for commercial vehicle driving. For commercial vehicle drivers, the criterion for a conditional licence ‘the condition is satisfactorily controlled’ has been removed so that the criteria focus on the main risks to safety, which are hypoglycaemia and end-organ effects. For both private and commercial drivers, the criterion for a conditional licence ‘the condition is satisfactorily controlled’has been removed so that the criteria focus on the main risks to safety, which are hypoglycaemia and end-organ effects. For the purposes of the standard the definition of severe hypoglycaemic event encompasses hypoglycaemic seizures. if the hearing threshold is not able to be reached with hearing aids, a person can be individually assessed for suitability for a conditional licence. For commercial vehicle drivers, where EEG demonstrating no epileptiform activity is required, timeframes for the EEG are now provided. For example, in the default standard, for a conditional licence an EEG conducted in the last six months must have shown no epileptiform activity, and no other EEG conducted in the last 12 months must have shown epileptiform activity. For drivers with epilepsy under treatment who have been seizure-free for an extended period (10 years for private drivers and 20 years for commercial), the driver licensing authority may consider a longer review period on the advice of an independent specialist. Ongoing review for commercial vehicle drivers will continue to be by a specialist in epilepsy. Neurological Conditions – Vestibular Yes This chapter has been deleted. Ménière’s disease is referred to in the text of ‘Other neurological conditions’. For private vehicle drivers, the requirement for a conditional licence and periodic review has been removed if the driver has recovered adequate neurological function. This reflects the non-progressive nature of stroke. The standard cross refers to management of treatable causes of stroke. The head injury standard for commercial vehicle drivers now includes criteria relating to risk of post-traumatic epilepsy. A non-driving period of 12 months (without seizures) applies if they are determined to have a high risk of seizures following a head injury. There is not a similar standard for private vehicle drivers. The standard for intellectual disability has been removed, including reference to IQ. This is covered in ‘Other neurological conditions’. if there is any significant field loss (scotoma) with more than four contiguous spots within 20 degrees radius from fixation. For commercial vehicle drivers, the review period for drivers with a conditional licence has changed from one year to two years. Why have the driver medical standards been revised? The driver medical standards contained in Assessing Fitness to Drive have been revised to reflect current medical knowledge and the current transport environment. Who has been involved in reviewing the standards? The standards have been produced through an extensive consultation process overseen by the National Transport Commission and Austroads, and involving a Maintenance Advisory Group representing driver licensing authorities, health professionals and drivers. When do the standards come into effect? The standards are effective from the 1 October 2016, replacing the 2012 edition. From that date, all drivers should be assessed using the new standards. What are the key changes to the standards resulting from this review? Assessing Fitness to Drive was extensively revised in 2012, focusing on conditions likely to affect fitness to drive and resulting in a simplified structure of 10 chapters. These changes have been well received and the current review has not resulted in major changes to the structure or to medical criteria. Ongoing improvement has been achieved through changes that provide clarity around the key considerations for assessing fitness to drive and support consistency of assessment and decision making. links to supporting consumer information. The key changes to specific chapters are described separately in the report Reviewing Assessing Fitness to Drive: Summary (1MB PDF). How will Assessing Fitness to Drive 2016 affect health professionals’ practice? The clarity of the new standards and improved guidance will facilitate assessment of fitness to drive by health professionals and ensures greater consistency in such assessments. It is not anticipated that the standards will impact on health professionals’ workload in undertaking assessments. 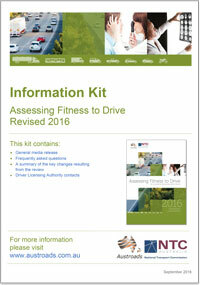 How will Assessing Fitness to Drive 2016 affect Driver Licensing Authorities? The clarity of the new standards will facilitate licensing management by Driver Licensing Authorities and support greater consistency in licensing decisions. Driver Licensing Authorities will need to manage the changes to the standards in terms of the impact on drivers with existing medical conditions, including those on existing conditional licences. How will the new standards affect drivers? The new standards do not mean a change in responsibility for drivers. They must continue to ensure that they do not drive if they have a condition that is likely to affect their ability to drive safely, and they must report such conditions to the Driver Licensing Authority. The standards reflect developments in medical science and improvements in diagnosis and treatment of various health conditions. They therefore provide scope for drivers with well-managed health conditions to continue to drive safely. There are a small number of significant changes that will affect drivers. 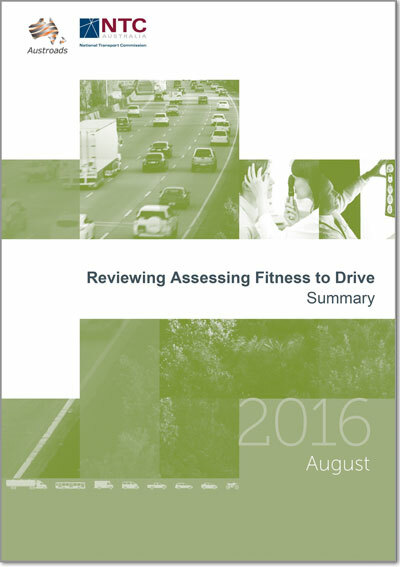 These are summarised in the report Reviewing Assessing Fitness to Drive: Summary (1MB PDF). The changes are summarised in the table above. Who should drivers speak to about how the changes might affect them? Drivers who have an existing medical condition and who are on a conditional licence, or have other driving restrictions, should refer to the Austroads website for an explanation of the changes. They may also speak to their local Driver Licensing Authority about how the new standards will affect them. How will Austroads communicate any future changes or issues relevant to health professionals and drivers? Register on this page to subscribe to alerts regarding updates to Assessing Fitness to Drive. Can I access a detailed report of the review? 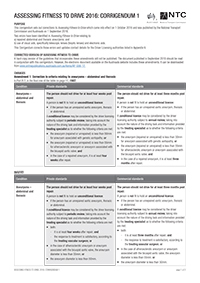 The report Review of Transport Medical Standards: Final Report for the Review of Assessing Fitness to Drive (1.3MB PDF) outlines the methodology and findings of the review.